The "California Edition" is an LWS 32 that has been modified to incorporate a trigger blocking manually operated safety that fulfills the manual safety requirements of the State of California. Prerequisite to a pistol being subjected to the laboratory drop tests and functional reliability tests, which a pistol must pass in order to be approved for sale in California, the pistol must have a manual safety. The guideline for a manual safety is that it must be of a type that qualifies as a manually operated safety device under the BATF (Bureau of Alcohol, Tobacco and Firearms) import guidelines. The trigger block safety (Patent No. 6,615,529) incorporated in the "California Edition" LWS32 satisfies this California requirement - hence the designation "California Edition" is stamped on the slides of this version of the LWS 32 pistol that has been approved for sale in the State of California. We have been making the basic design essentially unchanged except for caliber upgrades since about 1981. The pistol is a traditional CZ 45 type double action only design with one notable feature. The pistol's magazine safety is unusual in that when the magazine is removed, not only is the trigger blocked but also the slide cannot be pulled to the rear far enough to allow the hand loading of a round. As with other designs, applying pressure to the trigger while removing the magazine can deactivate the magazine safety function and so the finger should always be away from the trigger when this is done. The magazine safety is considered a passive safety device and does not meet the California manual safety requirement. The "California Edition" trigger blocking safety functions along the same basic principal as the magazine safety. Both block the trigger, and both restrict slide movement. The manual safety works as follows: Pushing the safety bar to the right puts the safety in the on position, while pushing it to the left puts it in the off position. A leaf spring resiliently engages the safety bar producing a drag on the bar so that it remains in the position to which it is moved. Because this is a double-action only self-defense pistol wherein the pistol is absolutely safe from discharge unless the trigger is deliberately pulled, the addition of a manual safety could potentially create a hazard if the safety were to accidentally shift positions so that the pistol's owner becomes confused as to the firing status of the gun in a life-threatening moment. For this reason, we originally opted to protect the safety so that it was necessary to use a tool of some sort to push the safety to the on position to ensure this could not accidentally happen during concealed carry. It was manually easy to put the safety in the off position, but a tool was required to put the safety in the on position. This arrangement did not qualify as a manually operated safety device under the BATF criteria. Quote: "Because the safety must be engaged with the use of a tool, it would not qualify as a manually operated safety for the purposes of the Bureau of Alcohol, Tobacco and Firearms (ATF) import criteria." In summation: To push the safety to the off position, the safety bar is pushed right to left until the safety bar is essentially flush with the side plate. This can be easily done with a fingertip or fingernail. 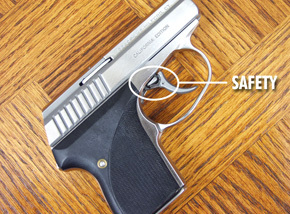 With a little practice, it can be done while the pistol is still in the owner's pocket. The safety will not accidentally engage from the recoil of shooting since pulling the trigger locks it into the firing mode position. To put the safety on, push the safety bar left to right until the safety plug is flush with the finger portion of the trigger. Supporting the back of the trigger with the index finger while using the thumb to position the safety helps facilitate the operation. REMEMBER: Always practice putting the safety on and off with an unloaded gun.